In 2010, Delly and Nicolas decided to renovate the Santa Giulia Hotel into a trendy and modern Boutique Hotel. 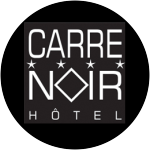 After two years of work and many adventures Hotel Carré Noir is born. We want our clients to be charmed by our fantastic view and to find peace and cosiness. Enjoy a virtual visit ! Our front desk staff will be pleased to assist you with any request you may have. Reach the front desk by dialing 9 from your room phone. Rooms are available at 3pm and must be vacated at the latest at 11pm on your day of departure. Late check-out is free but subject to occupancy. To request a late check-out, please contact the front desk in advance. A secure storage room is available for your luggage and personal belongings. We also have changing and shower facilities which are free to use for your convenience. The wifi is free and available everywhere in the hotel. Connexion is automatic. Please respect our non-smoking policy. You will find ash tray on your room balcony and on the terrace table. Unfortunately, animals are prohibited in our hotel. Reservation will be considered as definitive when we will receive a deposit of 50% of the whole stay. For any cancelation done more than 30 days prior to your arrival date, the full deposit will be paid back. For any cancelation done less than 30 days prior to your arrival date, the full deposit will be kept. For all shortened stay and no show, we will charge the full amount of the stay. Booked half board cannot be deducted or transferred. Drinks, phone calls, and tourism tax are not included in the room price.